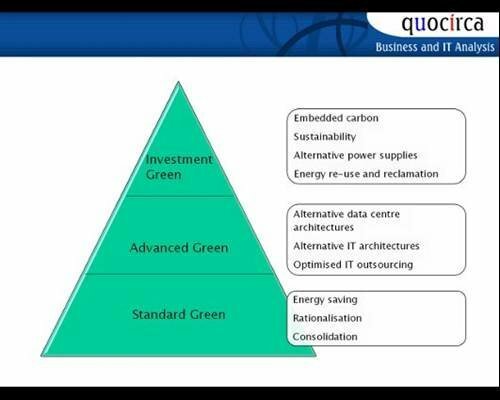 From an IT perspective, Quocirca breaks green initiatives down into three distinct areas. Advanced green – looking at changing the way IT is operated to give further savings, such as a move to internal cloud computing and/or blade computing. Investment green – a longer term view, where there is less chance of a direct payback on the investment, but where the capabilities for pushing green credentials as part of the business’ brand can resonate with the target customers. Here, such technologies as regenerative power, heat recycling and alternative power supplies come to the fore. Each area has its own part to play – but taking a Total Value Proposition approach to how green IT can help a business can make arguing for a given project far easier.